The most ambitious drone-based investigation of severe storms ever to be conducted will be launched in coming weeks by the University of Nebraska–Lincoln and three partner institutions — Texas Tech University, the University of Colorado Boulder, the National Oceanic and Atmospheric Administration’s National Severe Storms Laboratory and the Cooperative Institute for Mesoscale Meteorological Studies at the University of Oklahoma. More than 50 scientists and students are making final preparations for the May 15 start. Fieldwork for the project will continue until June 16 and will cover a 367,000-square-mile area of the Great Plains from North Dakota to Texas, Iowa to Wyoming and Colorado. “If there’s a supercell thunderstorm anywhere in the region, we hope to be there,” said Adam Houston, associate professor of atmospheric science at Nebraska and lead investigator. 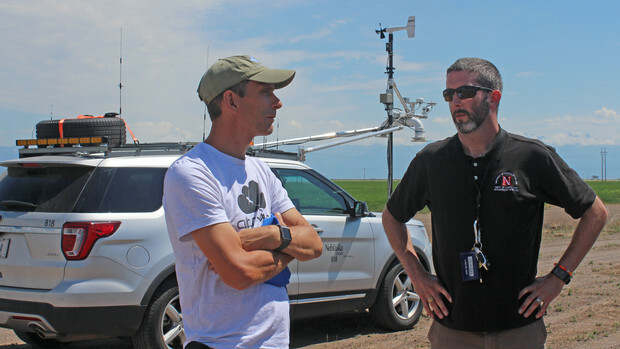 Targeted Observation by Radars and UAS of Supercells — or TORUS — will exceed $2.5 million, with the National Science Foundation awarding a three-year, $2.4 million grant and the National Oceanic and Atmospheric Administration providing additional financial support. Nebraska's Adam Houston (right) talks with a colleague during a storm chase. Houston said it is the largest-ever study of its kind based on the geographical area covered and the number of drones to be deployed. It will involve four unmanned aircraft systems (drones), a NOAA P3 manned aircraft, eight mesonet trucks equipped with meteorological instruments, three mobile radar systems, a mobile LIDAR system and three balloon-borne sensor launchers. Past studies have involved only one drone, Houston said. By flying four drones, scientists will be able to gather more data from different parts of a storm, answering a more extensive set of questions. The research goal is to collect data to improve the conceptual model of supercell thunderstorms, the parent storms of the most destructive tornadoes. Scientists hope to expose how small-scale structures within the storm — believed to be nearly invisible to all but the most precise research-grade instruments — contribute to tornado formation. By revealing the hidden composition of severe storms and associating it to the regularly observed environment, the TORUS project could improve supercell and tornado forecasts. Scientists want to reduce the number of false-alarm tornado warnings and improve detection of the potentially lethal storms. The Central Plains, aka “Tornado Alley,” serves as a great laboratory to better understand severe storms, Houston said. Although the central and southern Plains, including Oklahoma and Texas, remains the top U.S. area for tornadoes, a study late last year suggested tornadoes are occurring more frequently in areas of the Southeast and Midwest. During April, Houston and students in his Severe Storms Research Group will finish building a “Mobile Mesonet” SUV specially fitted with the instrumentation needed for the study. It will be one of three such vehicles supplied for the study by the University of Nebraska. The fixed-wing drones that will be used in the study will be supplied and operated by the University of Colorado and the University of Nebraska. The research group will hold a media day at the Salina, Kansas, Regional Airport May 14 to explain the TORUS project and answer questions. Media who wish to participate should contact: Emily Summars, communications specialist, Cooperative Institute for Mesoscale Meteorological Studies, at emily.summars@noaa.gov; Keli Pirtle, NOAA communications, keli.pirtle@noaa.gov; Cheryl Dybas, National Science Foundation communications officer for environmental research, cdybas@nsf.gov; Amanda Bowman, public affairs at Texas Tech University, amanda.bowman@ttu.edu; Daniel Strain, science writer at the University of Colorado, 303-735-5875 or daniel.strain@colorado.edu; or Leslie Reed, public affairs director at the University of Nebraska-Lincoln, 402-472-2059 or lreed5@unl.edu.